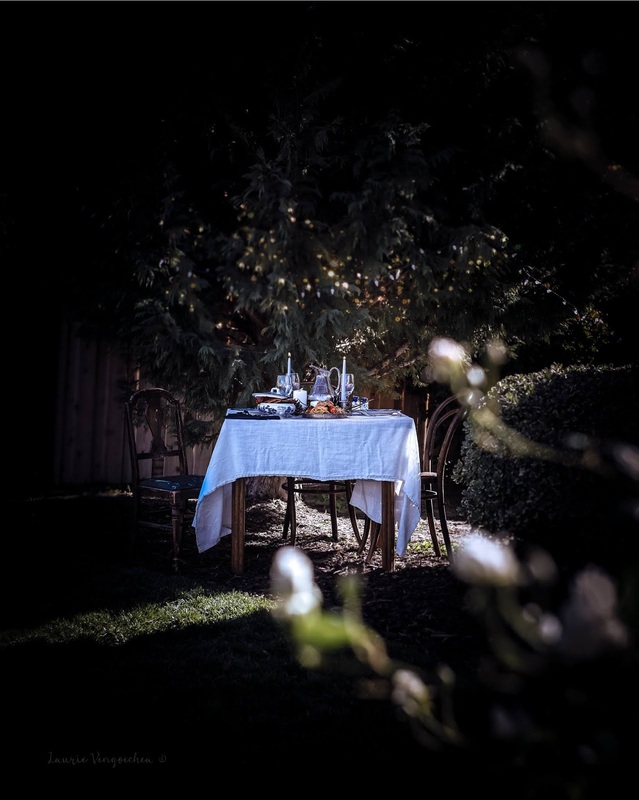 The most memorable events in my life have all stemmed around the family table. 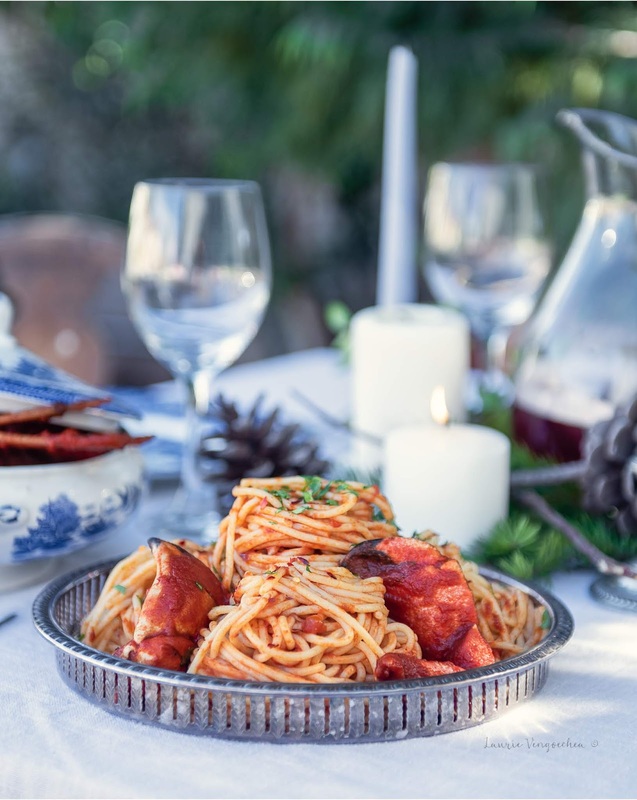 Whether my parents took tradition with them from Italy, to Philadelphia, and then to California, tradition has always remained deep in our meals and in our gathering. This family recipe is traditionally Italian American with its roots in South Philadelphia, lovingly known to many as, South Philly. Although I was quite young when our parents moved us to California, I can still remember the sight of Italian mammas sweeping their little piece of pavement in the front of their stylistic row house and the smell of freshly baked pretzels coming from the corner vendors. It was a close-knit community of Italians, who met frequently in either a neighborhood deli, or in a formal dining room laced with gold filigree and beautiful china, ready to service pastries and wonderful Italian delicacies. One meal that I truly didn’t appreciate till many years later in our California home, was Crabs and Macaroni. Although it was a dish with roots in the Italian community of South Philly, it traveled with my parents, aunts, uncles and grandparents, as they created their own little Italian community in the beautiful wooded area of Anaheim Hills, where orange groves became our row houses, and eucalyptus trees donned themselves like towering skyscrapers. I would definitely use the word “blessed” to describe a childhood, where we could walk a short distance to arrive at my grandparents’ home, and then another few feet to arrive at my aunt and uncle’s. Gathering around the family table was common and always something to look forward to. Crabs and Macaroni was the perfect get together meal, it was an event that took not just a stroll to the local grocery counter to fill an ingredient list by, but a well-planned trip to the shores of San Pedro, where the perfect catch of pacific crab was caught and made ready by local fisherman. Excitement exuded throughout the whole family, as we made our way to the Pacific Coast beaches of California, and then back to our family kitchen, where hours of preparation gave way to gathering around the family table to partake and give thanks to God for the love we shared with one another. 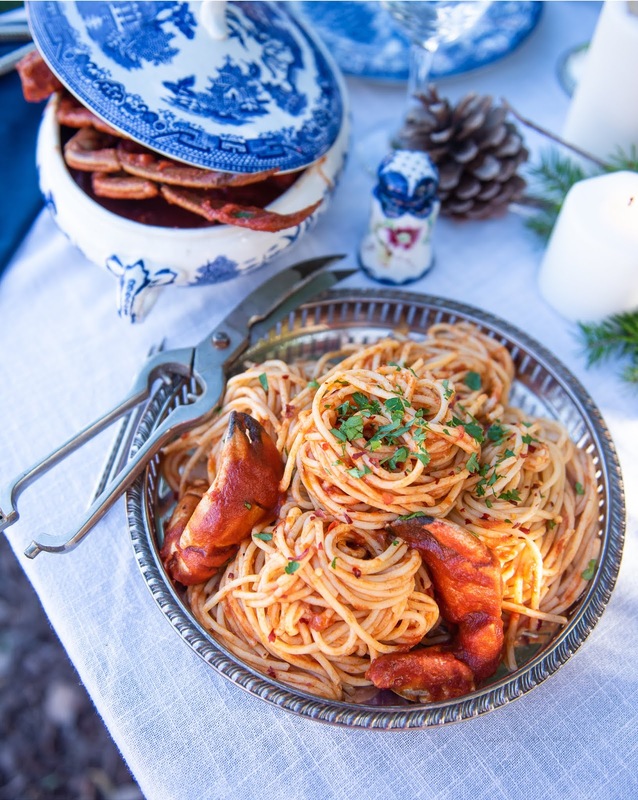 Imagine, large bowls of saucy crab set out on the table alongside hot and steamy spaghetti right out of the pot. Crab crackers and prongs, decanters of chianti, and lots and lots of wet cloths to cleanse the hands and faces that have been smothered in tomato sauce after slurping the juices from the crab legs and claws. So much deliciousness, so many giggles, so much love as we celebrated each other over one of the messiest and most memorable meals in our recipe repertoire. I love and cherish this recipe for the memories it evokes, as well as the sheer enjoyment of preparation, and taste it gives. A taste memory that will forever stay on my palette. Clean crab parts rigorously with scrub brush. Set aside in refrigerator. In large stock pot, heat ¼ cup olive oil, add aromatics; Onions, shallot, garlic and fennel, sauté until tender and golden brown. Add more olive oil as needed. Pour all of your tomato sauce into pot, add tomato paste, water, white wine, red pepper flakes, and black pepper. Add around ¼ teaspoon of salt. As sauce cooks, you may add more salt as desired. Cook on low heat for 2-3 hours. Taste and add more spices as needed. I love it spicy! In second large stock pot, heat water, cook pasta according to package directions. Don’t forget to salt the water! Remove set aside crab from refrigerator. In large sauté pan, heat 4-5 tablespoons olive oil, add reserved onion and garlic and sauté till golden. Add crab legs, claws and crab body to the sauté pan. Cook till garlic and onion look browned, around 4-5 minutes. Add contents of pan, i.e., all crab as well as garlic and onion and pan drippings to the tomato sauce. Crab only needs to be cooked in the sauce for 15 minutes for doneness and its beautiful aroma to flavor the sauce. After 15 minutes, remove sauce from the heat. Remove crab. Separate crabs and sauce into a few large serving bowls. Serve alongside hot steamy pasta and parmesan cheese. Enjoy! This dish requires fresh Un-cooked crab. 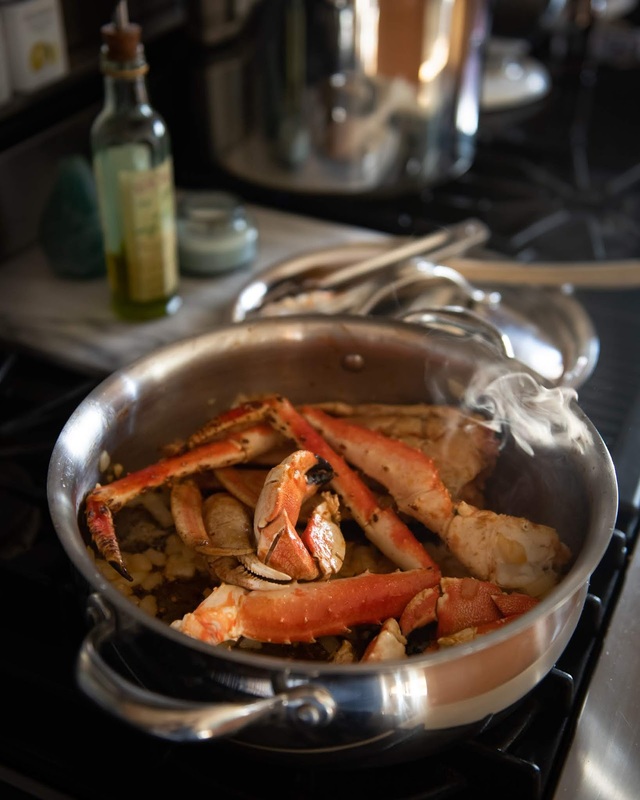 If you choose to make it with pre-cooked crab, you won’t have the full flavor of the crab perfume in your sauce, and you will most likely have a crab meat that is a bit chewy, but the sauce will still taste beautiful! Cyndi, thank you so much for this lovely message! It means so much to me! Such a lovely post Laurie, rich in memories, steeped in love. And a beautiful dish to compliment the story as well.